Meatballs are traditionally found in cuisines throughout Europe, Middle East, and South and East Asia. Largely through the European culinary heritage, they are also staples in North and some parts of South America. In a number of cultures, the term for meatballs is derived from the Persian word kufta which means "to beat" or "to grind". 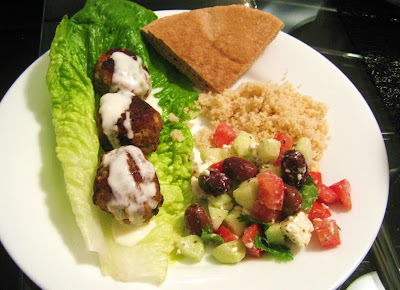 Examples include the term kofta (India/Pakistan), keftes (Greece) and qofte (Albania). The Spanish word is albóndigas, derived from the Arabic word al-bunduq which means hazelnut (referring to their shape). Albóndigas were introduced to Spain during the period of Muslim rule. Similar words are used in Portuguese and Tagalog. Meatballs are typically made with beef or pork though many other kinds of meat are used including veal, reindeer, lamb, chicken and turkey. They are usually a combination of ground meat, grain (breadcrumbs, rice, bulgur), vegetables or onions, eggs and spices/seasonings. Some varieties contain cheese. They can be fried, baked, boiled or steamed and served on their own, or in a sandwich, gravy, soup or pizza. This recipe comes from my friend Bekah. She made these delicious meatballs for dinner when we visited her in Montreal this summer. I tried them last week when I had visitors from Rome and Chicago. They were a hit. Don’t skip the yogurt sauce – it’s a key element of the meal. 1. To make the yogurt sauce, in a small bowl mix all the ingredients and set aside. 2. To make the meatballs, in a large bowl, mix the first six ingredients with a spoon. Add the egg and mix well. Then add the turkey and use your hands to incorporate with the dry ingredients. 4. Place olive oil in a large skillet over medium-low heat. Cook meatballs, turning occasionally, until well-browned on all sides. To make sure the meatballs are tender and fully cooked, add 1/4 cup water to the skillet and cover to steam the meatballs for about 5 to 7 minutes. To test for doneness, cut the largest meatball in half and make sure there is no pink meat in the center. If there is, continue to cook. 5. 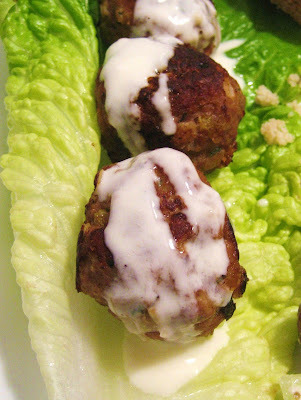 Serve meatballs rolled inside lettuce leaves and generously drizzled with yogurt sauce. Serve with cous cous, flatbread and a salad. Double or triple the recipe - if you make a big batch freeze most of the meatballs raw for a future meal, and freeze a few cooked so they can be used on a whim to add heft to a marina sauce or for a midnight meatball sandwich. 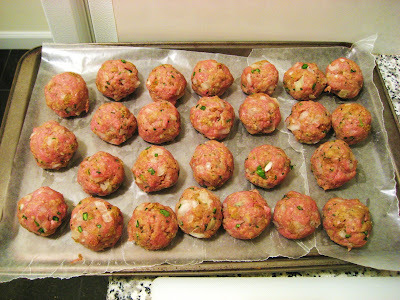 Frozen raw meatballs should be defrosted overnight in the refrigerator and cooked well. Welcome to TREAT A WEEK, which features original recipes from around the world. Although I have a soft spot for dessert and brunch, my recipes cover all meals. I try to bring a cultural and historical perspective to food, and love to feature recipes specific to less known holidays. I hope you will enjoy reading this blog. Please feel free to comment - including questions and constructive criticism. To search for recipes type an ingredient or key word into the white box in the top left hand corner of the homepage, and hit the magnifying glass icon to run the search. Alternately, search for recipes by type in the KEY WORD SEARCH half-way down the right-hand margin. To receive an email when I post, Follow me with Google Friend Connect or sign up through Google Groups or contact me at: treataweek (at) gmail (dot) com. Gourmet Project, Recipes from the "Gourmet Cookbook"
Unless otherwise noted, all recipes are the original creation of AKR. All photos by AKR and LPJ. Please do not post or publish without citing. Contact me if you have any questions: treataweek (at) gmail (dot) com.